Knowledge : Maru-Obi - KIDORAKU Japan - What a Kimonoful World! Maru-Obi is the most formal Obi. It's worn by brides, Geisha or Maiko with a formal kimono. It's around 30cm in width, and 400-450cm in length. Before WW2, Maru-Obi was a standard of formal Obi. It's stiff brocade and is folded over lengthwise from twice width. It has same woven design on the face and reverse side. And it has Obi-ita (a thin stiff board) inside. So it's too heavy and hard to wear it, and very expensive. Sometimes it is priced at tens of thousand dollars. After WW2, Fukuro-Obi has taken the place of Maru-Obi. Now, almost all people wear Fukuro-Obi for formal kimono. Only brides, Geisha or Maiko are wearing Maru-Obi. that is called "Darari-Obi" or "Darari-no-Obi" and is 700cm in length. 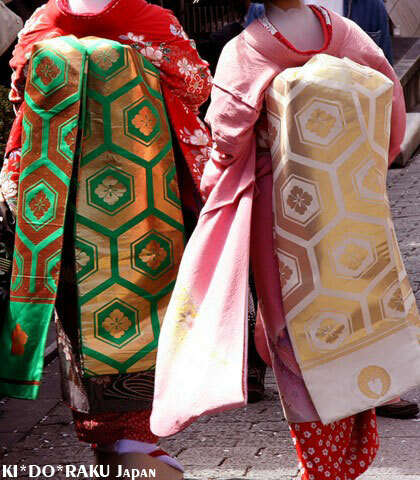 In Kyoto, when Geisha and Maiko wear kimono, "Otokoshi" help them. "Otokoshi" are specialist of putting on kimono and tying on obi. "Otoko" means "men". So all of them are men and are stronger than women. They can tie Maru-Obi easily than other women who help putting on kimono.